The existence of the Portuguese Water Dog along the Algarve on the coast of Portugal can be traced back to very remote times. Evidence exists which indicates that in pre-Christian times, the "water dog" was held to be nearly sacred, and severe penalties came to those who killed a "water dog". There are many theories surrounding the dog, but none dispute that this remarkable dog has an ancient ancestry. The first written description of the Portuguese Water Dog is dated to 1297, and concerns a monk's report of a dying sailor who had been brought out of the sea by a dog which had a "black coat of rough hair, cut to the first rib and with a tuft on the tip of his tail". Due to the historical clip still in use, many writings describe the breed as a "Lion Dog". It is said that the current day Poodle, Kerry Blue Terrier, and Irish Water Spaniel are possibly ancestors of the "water dog". In Portugal, the breed is called Cão de Água (pronounced Kown-d'Ahgwa). 'Cão' means 'dog', 'de Água' means 'of water'. In his native land, the dog is also known as the Portuguese Fishing Dog. Cão de Água de Pelo Ondulado is the name given the long-haired variety, and Cão de Água de Pelo Encaracolado is the name for the curly-coat variety. 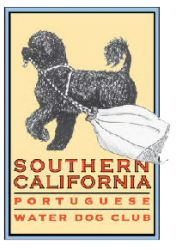 •In 1972, sixteen dedicated owners and friends of the Portuguese Water Dog gathered in New Canaan, CT, to form the what now exists as the Portuguese Water Dog Club of America. There are currently over 1,000 members of this national club. •The Portuguese Water Dog was admitted to the Miscellaneous class of the American Kennel Club (AKC) on June 3, 1981. Three months later, the breed had its first Obedience champion, Spindrift Kedge. Off square; slightly longer than tall when measured from prosternum to rearmost point of the buttocks, and from withers to ground. Strong substantial bone; well developed, neither refined nor coarse, and a solidly built, muscular body.